Lissa Bryan: The #ShieldGeeks Review #VIKINGS Episode "What Might Have Been"
The #ShieldGeeks Review #VIKINGS Episode "What Might Have Been"
We opened with a scene of Lagertha blessing Kalf's grave, sowing its soil with blood. Erlendur approaches and asks her why she killed Kalf. Lagertha says she did it because she promised. She told him she would kill him for usurping her earldom and she did. She asks Erlendur if he'll be leaving now that Kalf is gone and he says that he wants to return with her to raid Paris again. Torvi's little son comes over and she tells him she's going to be going away for a while. He should cherish his friends, because many of them will die soon, and those that don't will betray him. Sandi: Something that always strikes me about Lagertha is her willingness to get her hands dirty. She flinches from nothing. I love that about her. 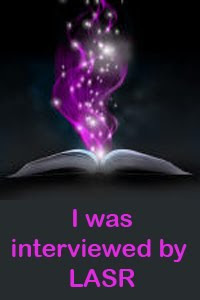 She met her oath, as well, even if part of her didn't wish to do so. That she gives that advice to the boy is poignant, as she's been betrayed and has, after a fashion, betrayed others. 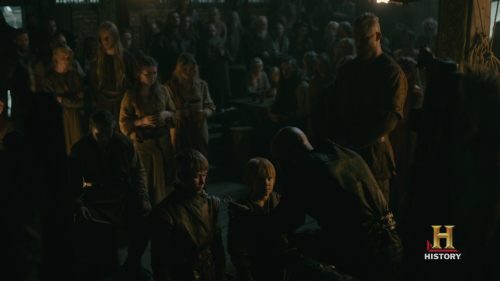 In Kattegat, Ragnar's sons Ubbe and Hvitserk are given their arm bands by their father in a sweet and touching ceremony. The boys swore fealty to their father and became men in the eyes of the Viking culture. It was a lovely, warm moment, and Sandi contrasted it with the same scene in season one, when Björn was given his. Ragnar announces he'll be taking the boys with him to Paris. Aslaug, not respecting their new status, protests that they're too young. 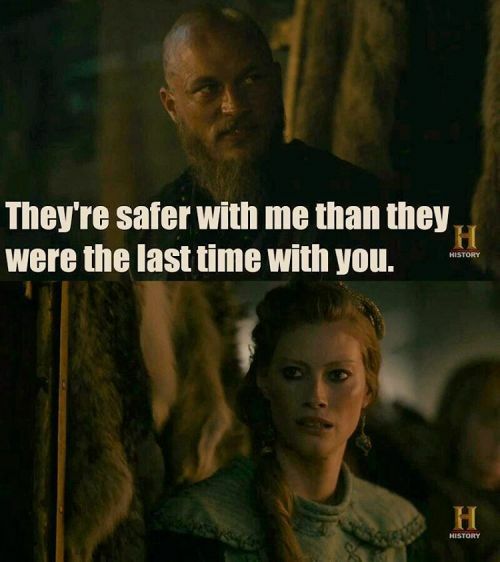 Ragnar - probably stung a bit by this - jabs back at her by saying the boys will probably be safer in his hands given what happened last time he was away. Sandi: Ragnar—sounding breathless, but happy—asks the boys to taste the offering of earth and salt. They then touch both dirt and salt rocks with their tongues. I'll have to check, but I don't remember if that was part of the ceremony in the first season. I love that Björn is the one holding the sword that is used in place of a salver that might be used in a Christian communion service. An interesting unspoken moment, I think, happens when Ragnar tells the boys they are swearing their allegiance "to your father" and Aslaug sort of starts in alarm. The tug-of-war between the king and his queen over their sons has been ongoing this season, and this is a part of it. Ragnar is holding, in essence, the threat of being barred from Valhalla if they aren't loyal to him. Wow. By making them men, Ragnar has essentially cut their formal ties to Aslaug. A mother had the raising of her children when they were small, but young men were expected to gravitate toward their father and the male line as they matured. In Wessex, another boy is becoming a man, but in this case, by going on pilgrimage. Burger King Ecbert is sending Alfred on a journey to Rome to meet the Pope. When Ecbert announces this, Judith's eyes light up with excitement. With him is going Father Prudentius, and conveniently enough, Judith's husband Aethelwulf. Little Alfred isn't quite as excited. He asks how long the journey will be. 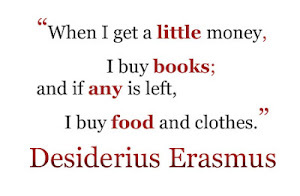 Prudentius tells him they'll travel about twelve miles per day by foot and Rome is a thousand miles away. 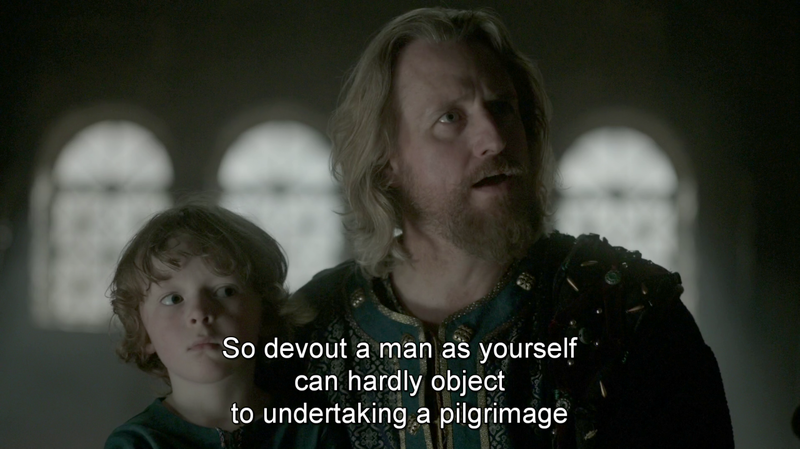 Ecbert gives a little speech about what a great thing a pilgrimage is. After the court applauds, the little boy dashes away behind a pillar and fights off a panic attack. I didn't even think about the idea that Ecbert might be intending Alfred for the church. Good catch! You're absolutely right. It would be very smart for Ecbert to push Alfred's destiny in that direction at this point. As you noted, second sons were often pushed in this direction - willing or not! Ecbert already has the secular powers wrapped up. It's smart to have a thumb in the proverbial pie of the church as well. Albert would be "fast-tracked" because of his rank and rise quickly in the church. He could be Pope one day. 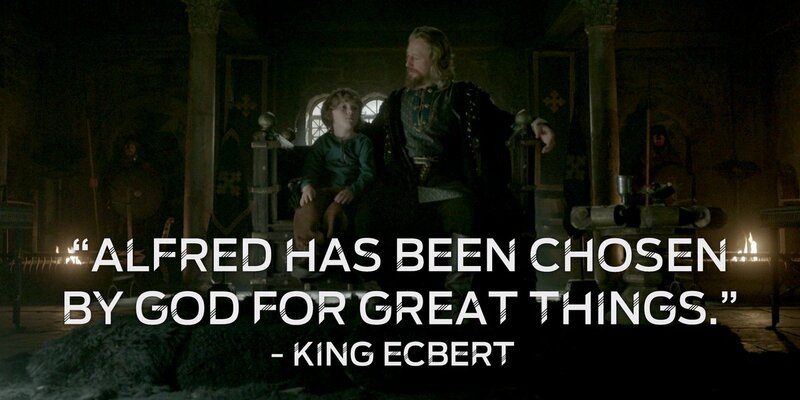 Of course, history tells us his destiny was something different, but Ecbert is thinking wisely, planning ahead for his grandsons and settling the balance of power in Mercia for the generation to come. 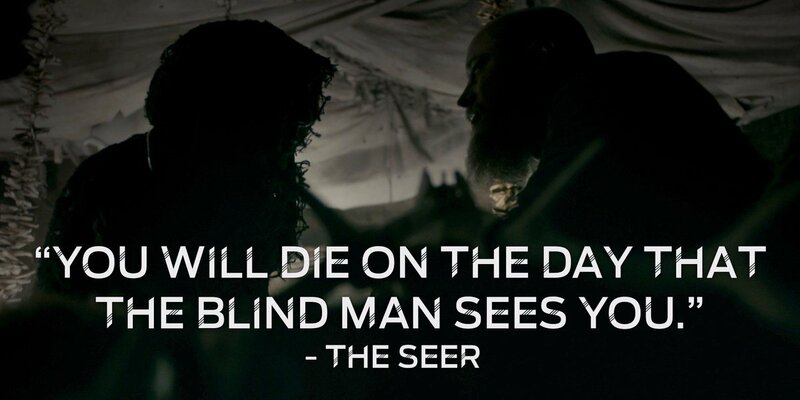 Ragnar goes to visit the seer before he leaves, and the Seer tells him of the day of his death: Ragnar will die the day the blind man sees him. Later, we see him with Yidu. He asks for more of the medicine and says he'll need a stash of it for the journey. Yidu says she can't do that because Ragnar is like a greedy child with it; she has to control how much he takes. So Ragnar had best take her with him when he goes. Sandi: Everything about Yidu is now having my inner Robbie the Robot calling, "Danger! Danger Will Robinson!" Her approach to Ragnar is seductive, making sure to expose her skin as much as possible, yet his attention is on the "medicine" she has made sure he's very much into. Whether this is a true addiction (with withdrawal as a threat for the future) or just the wish to feel the release of it (with irritation and anger but no physical symptoms) remains to be seen. I hate to think of Ragnar in the thrall of any kind of addiction. The ships depart Kattegat and it's one of those lovely scenes the History Channel does so well. Gifts they bestow upon us geeky little fans. A chanter sings and beats a drum as they depart, and I'd love dearly to know what song it was he was singing, because you just know the History Channel had him sing an authentic Viking poem as the ships departed. Sandi: Oh, I was smiling with one of those big, goofy smiles that belongs on a fangirl at a convention. It was awesome. I heard the Old Norse and swooned, even if I didn't know what it meant. It is scenes like these that make me smile at our boot-sole file. Floki has chosen to take the ship occupied by Harald Finehair and his brother Halfdan, whom Floki calls his new friends. He says he'd rather sail with them than Ragnar because these men love the gods as he does and would never betray them. After he speaks, he gives one of those little Floki giggles, but there's an odd edge to it. His tone is biting and bitter. Sandi: Did you get the feeling that Harald and Halfdan are courting Floki, after a fashion? Making much of him, wooing his pride, making him feel as comfortable as possible. Note the deference they pay him, the proximity they maintain throughout. If Floki were a woman, I'd think they were trying to bring her into a relationship of one sort or another. And yes, Floki's giggle is bitter. Edged. Is he playing another spy game for Ragnar (as he's done so effectively before) or has he truly "gone to the dark side" even as he seems to be groomed for the role of Kattegat's new Seer? Oh, yes. Floki is being courted. But this time, I think he might actually be going to "the other side." As some of our Twitter convos revealed last night, Floki has never lied to Helga before about his thoughts and motivations. Refused to speak, yes, but never lied. He's telling her now that Ragnar is no longer his friend. He humiliated Floki. Tortured him. Betrayed the gods. Floki may not turn out to be willing to work against Ragnar, but he seems no longer emotionally bound to him as he once was. In Kattegat, Sigurd walks into the house and finds Aslaug breastfeeding Ivar. It's an odd scene, because Ivar is obviously past the age where mothers have usually weaned their children. @LissaBryan @DeeDonuts Well...it's a mother's choice, by and large. In my eyes, if a kid is old enough to crush a skull in? Nursing is over. Aslaug merely looks back at Sigurd when she sees him watching, and tells him if he's lonely because his brothers have departed, he should go play with Siggy. Outside, Sigurd mocks Siggy for being dirty and asks her if she ever bathes. Siggy runs back into the house. It seems to imply the poor little mite is neglected, which seems strange. @DeeDonuts @sandyquill #SIGGY is the granddaughter of a king, daughter of the heir to the throne. #ASLAUG would be wise to care for her. Sandi: I keep looking, but there's no indicator that Sigurd Snake-in-the-Eye still has a snake in his eye. Sigurd must be feeling quite bereft, really. His older brothers in their father's favor and gone on a raid. His younger brother in his mother's favor and garnering most of her attention (as had long been the case, likely). He's left with his "dirty" cousin as a playmate, but she's not a playmate for a young boy. She's a tag-along. This might build to resentment or something in the future. Back on the ship at night, we see the Ubbe and Hvitserk wrapped warmly in furs. Yidu tells them not to be afraid and she starts singing. A tear tracks down her cheek, but I don't know why. I did see Floki's face when he heard her; he appeared quite unsettled. What is he sensing? An appeal to a different set of gods, perhaps? Or is it the foreign-ness she represents? Soon, Aslaug sees a stranger in the doorway. It's Harbard. He's returned. Aslaug asks him why he's come back, and he tells her he can take away all of her pain and sorrow. Sandi: The concept of "freedom" is raised again, here. Harbard promises Aslaug freedom if she comes to him. And . . . she walks toward him. On the ship, Ragnar uses his sunstone as the ships get parted and misdirected. Sandi: And back in Wessex, we see Judith's sorrow as she bids her son goodbye. So maybe it's sinking in that he'll be gone? It's quite an occasion, seeing the pilgrims off. Ecbert, who has been so protective of Alfred, must have something up his sneaky sleeves, here. When they approach the coast of France, the scarlet sails of the Vikings are unfurled, and oh... It was a magnificent sight. How it must have struck fear into the hearts of villagers! Onshore, Floki scoffs at the boats they pass. They find some Frankish troops, and they do what Vikings do. Bodies are strewn about. We see Ubbe and Hvitserk practicing their archery on some hanging bodies. One poor soul is set adrift, strapped to a wide board. Floki and his "new friends" take a few others to a beacon post that's been lit to warn Paris the Vikings have arrived. They say they have another warning to send Paris. They bind the men to the legs of the stand and set it on fire, celebrating as the Frenchmen scream. From the edge of the woods Björn watches this. His little brothers come up from behind and witness the spectacle, too. Björn doesn't seem pleased by it. Sandi: This is really the darker side of the Viking raiding culture. This is psychological warfare, and that's never going to be pleasant. I wonder what Björn is thinking, here, and if he and his brothers will ever talk about it? Björn Ironsides wins renown in the future as a warrior, but did he use such tactics? Ragnar and Lagertha have a quiet moment. She's sharpening her ax as he sits down beside her. He asks her about Kalf's death and whether it broke her heart. Lagertha gives him a small smile - more of a grimace - and says no, her heart was broken long ago. He asks her why she's with them on this raid, risking her baby. So it does appear that Lagertha really is pregnant, but the Seer's prophecy that he could see no children as far as he looked rang in our minds. Lagertha is pushing forty or so, by my reckoning. A dangerous age for a pregnancy in that era, and she had such a tragedy the last time she was with child. Sandi: Is she acting under guidance from the prophecy, convinced that she won't carry the child to term so it doesn't matter if she fights or not? Or is she acting in defiance of it? It is interesting and, yes, I think it's a bit sweet that Ragnar expresses concern for her. But she informs him indirectly that he broke her heart long ago and it never really grew back together in that way. In Paris, Simple Chuck talks to Rollo and says the Vikings have returned. He promises he - the grandson of Charlemagne - would get down on his knees before Rollo to plead with him to defend Paris. 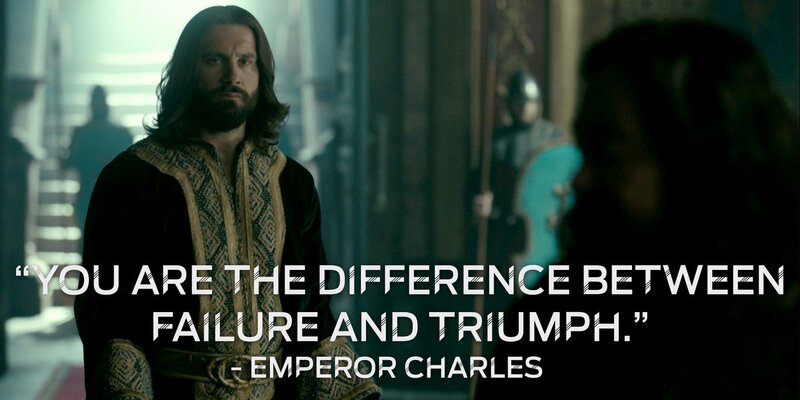 Rollo swears in the name of Christ that he will. Sandi: He swears he will not betray his wife, and Gisla flashes a bit of smug, right there. Rollo has pledged himself to this new life and he's not going to betray them. I feel that this time? He's firmly opposite his brother Ragnar and it will remain thus. How will they greet one another when they meet again? I am dying to find out. Therese is talking with Darth Odious in his chamber. He has changed his mind about trusting Rollo, a pagan, to defend Paris. He's working himself up into a rage. Therese finishes her wine and asks if he wants her to undress. He says he wants to chain her up clothed, and as he does, he reveals he intends to defend Paris, and then kill Simple Chuck and make himself emperor. Therese pretends to moan and get excited about Emperor Odious as he whips her savagely. Sandi: I feel, here, that Darth Odious is more aware of the undercurrents, when he's sober, than he lets on. That he knows of the plots and counterplots that are being worked out in the Frankish Court. He's angry and he's going to let this play out, perhaps. I think he can be patient, if he's thinking. But here, he's not. As the skipniu are sailing up the river, Ragnar has a vision. A white horse runs along the beach, and it leads him to... Ragnar's old farm. Lagertha is standing there with Gyda in her arms. Athelstan is behind her on a small bridge. And Björn as he was when we first met him, a fierce, stubborn Viking boy. Lagertha beckons to him. Ragnar shakes his head to clear it and the vision vanishes. Sandi: I miss that First Season Ragnar. Back when it was just him, his sunstone, his ambition, but also his farm, his goats, his new slave Athelstan and his daughter still alive. But his story is a story of a life fully lived, I think, with all its ups and downs. 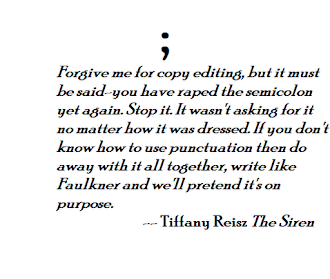 Writing-wise, this was a poignant scene and I wonder if it's prophetic in any way. As the Saga Thing Podcast said last night, Ragnar saw the doors of Valhalla shut to him earlier in the season. Now, he has also seen a glimpse of the Heaven he wants so badly, but it seems he'll also be denied. @LissaBryan @sandyquill That's a great point. He saw Valhalla closed to him in the s4 premiere; now he's seen the heaven he cost himself. The ships near Paris. Björn notes with a tone of concern that they haven't seen Rollo's camp. Lagertha looks up to see Rollo on horseback with French troops around him. Björn roars at him, "Uncle!" but Rollo does not reply. Sandi: Indeed, we get reactions. Floki looks unsurprised but disappointed. Ragnar hits a mast with his arm. Erlandur is all, "Is that Rollo?" As if he didn't know. Lagertha seems impassive, but her mind is working for sure. And Björn's whole aspect speaks of betrayal. Yes, he left Rollo behind and yes, Ragnar chewed him out about it, but I think Björn still hoped to see his uncle, there. The one who supported him when he was a boy, who helped him learn how to fight, who spoke with him man to man. Who fought with them when they both needed the outlet. And that man, Uncle Rollo, is now Frankified. Björn is betrayed as well. In Kattegat, Aslaug leads Harbard over to the bed of her sleeping son, Ivar. They wake the boy and she asks him if he remembers Harbard and the child giggles. What in the world could they have in store for him? Sandi: I don't know, but the giggling reminds me of Floki. This has been a satisfying episode and I can't wait to see what is coming next week!